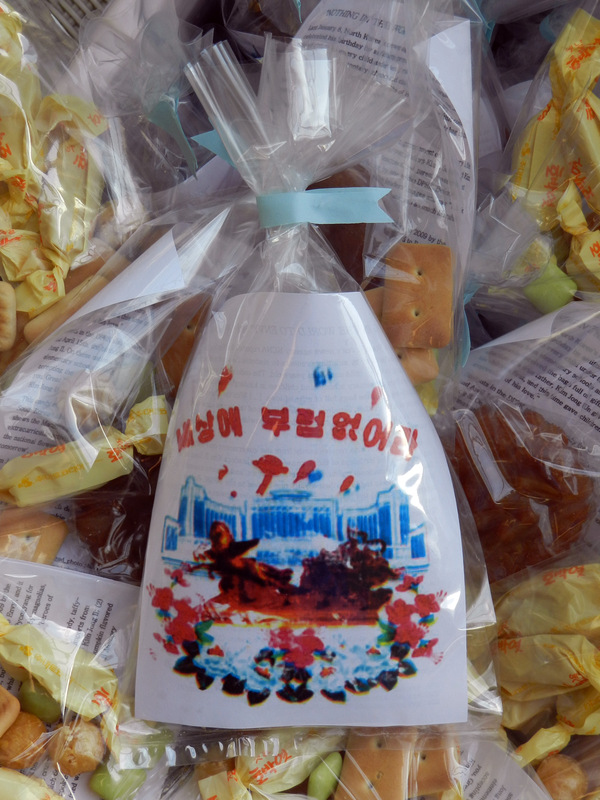 On Wednesday we will be handing out the same free candy that Kim Jong-Un is giving (in an insidious annual practice) to children throughout North Korea to celebrate his birthday. This candy bag is modeled from an image released out of China in 2009 by the South Korean site DailyNK. Its label reads ‘Nothing in the World to Envy’, and it shows the Mangyongdae Schoolchildren’s Palace, built in 1989 in Pyongyang for extracurricular activities. The chariot statue – which is surrounded by magnolias, the national flower, and Kimjongilia begonias – carries children, the ‘heroes of tomorrow’. Kim Jong Il’s gift bags contained peanut crunch balls, white peanut candy, taffy-like caramels, cookies and biscuits; this package includes similar imports from South Korea: (1) a peanut crunch ball of the exact brand given by Kim Jong Il; (2) apple-flavored gum, which defectors say was a rare bonus; (3) pumpkin flavored taffy; (4) a traditional cookie called Royal Medicine; and (5) a square Memory Biscuit that soldiers fried with sugar during the Korean War.